Right at this moment version 2.3 has been finished, which now just has to pass the review-process before you can see it in the App Store. What’s new is the AirPrint function for iPhone, iPod Touch and iPad. 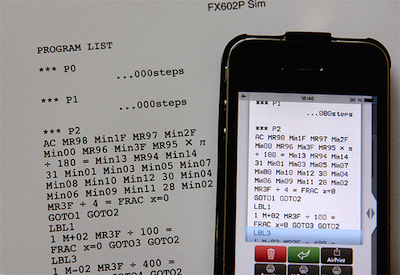 Number lists, calculation steps, program outputs or program listings can now be copied on paper. Therefor a new button has been created. On the iPhone it is in the printer-view right next to the green linefeed-button. On the iPad it is in the bottom left area, right next to the switch. To say it right away: Calculator output cannot be streamt “live” on a real printer. You print just that, what has been virtually printed on the paper strip in the printer view already. In a printer dialog you can specify whether you want to print all or certain pages only. There are some news about the clipboard also. So far you could define with a switch in the settings whether the last result shall appear in the clipboard. This switch now is called Print-out to clipboard and it causes the entire content of the virtual paper strip being copied to the clipboard. Copying is done automatically when you switch to another app, where you want to paste the content.